My latest strategy for procrastinating on papers (and to a lesser extent exam studying): looking at stuff that is at least marginally related to what I’m supposed to be doing. Like when I’m trying to write a philosophy paper but I have no idea how to answer my own questions and my brains are starting to fall out of my left ear. So I start looking at stupid philosopher chicken jokes. 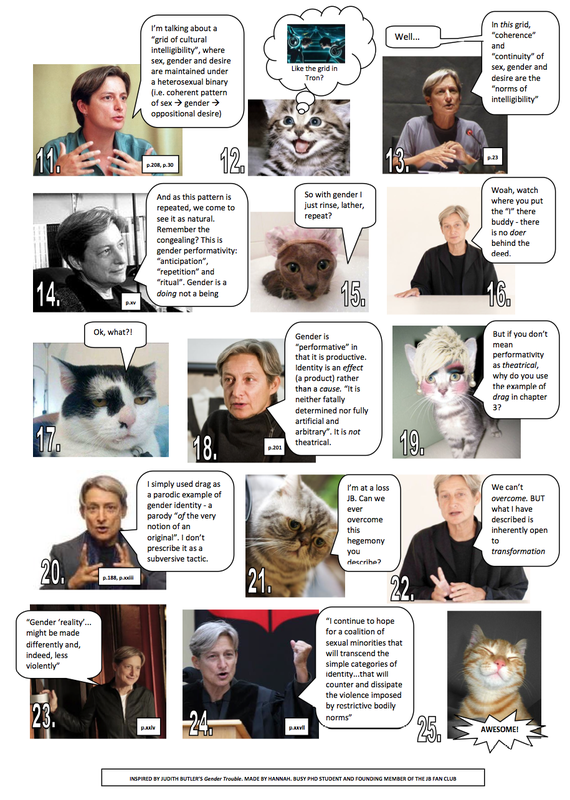 Or Judith Butler explained with cats. And eventually I end up with something new to say. I’ve always thought that the ideal of being “productive” or “efficient” is a little off, particularly when it comes to things like writing. 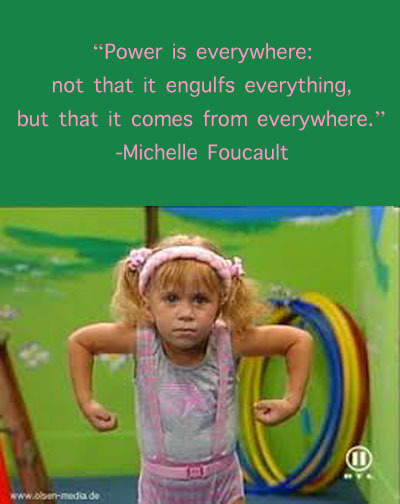 Because while we may like to imagine that we can just put the fingers to the keyboard and crank out a paper using sheer willpower, the real work is actually thinking, which doesn’t really respond to brute force. It’s just not always possible to make your brain to spontaneously churn out new ideas about a topic that it didn’t have before. You have to put some stuff into your brain to get stuff out of it. And for me, it has to be something I genuinely want to be looking at if I want a chance of sticking with it (against the siren call of Netflix) long enough to get some gears turning. Sorry I haven’t posted in a while. I’ve had a bunch of papers and midterms and rehearsals and general life crises. Basically life has been sort of crazy and I literally haven’t had a minute to post anything. Anyway, back to talking about Buzzfeed or dancing gerbils or whatever . . . The excuses are just excuses: Have I been having some life crises? Sure, but what else is new. Have I had a bunch of work due? Yes, but it’s not like I didn’t spend an equal amount of time procrastinating paper writing on Facebook as I did actually writing papers. Saying “I didn’t post because I was busy writing a paper” isn’t any more accurate than saying “I didn’t post because I felt more compelled to passively experience the mind-numbing properties of the internet.” Which I think is valid too, because . . . I don’t need an excuse anyway: Why do I have to justify not doing anything? Who decided that the only acceptable reason for someone not doing something is to be doing two, three, or twenty other things at the same time. I’m not a big fan of all this “productivity worship” that makes us feel like we’re morally inferior or wasting space by doing anything besides highly efficient, insanely multitasked work with concrete results. There is nothing wrong with doing nothing. In fact, I probably don’t do enough nothing. I’ve been doing quite a bit of writing about dance performances lately. And I feel kind of guilty. A dance is alive. It’s made up of infinitesimal moments of movement with emotional flavors which occupy a space not necessarily beyond words, but between words, in the range of deeply specific experiences that our linguistic boxes forget to catch. It’s alive because people make it and people do it and people watch it and people are never the same from moment to moment. It’s alive because sometimes dancers fall and sometimes they don’t. It’s alive because it’s fleeting, morphing, dying before you. It’s alive because, at least on some level, people usually don’t really know what it means (even in super literal narratives, all the dancing in between the narrative landmarks is up for interpretation). This way, it can mean everything at same time, or a strange mix of things, or whatever you at that moment need it to mean, and you don’t have to describe any of it. And then there’s words. Words are definite and limited and discreet. At best, they can hint at the essence of an experience. At worst, they reduce it. Words can be vague (and I like this kind), but we usually (at least in the case of performance papers) try to make them clear, so that their meaning is stable and universal. This makes words immortal. It also makes them dead. A clearly worded sentence will still be there tomorrow, telling you the same thing it did yesterday. When I was in second grade, someone from a museum came to my class to talk about butterflies. I loved butterflies. I loved trying to catch the ones that fluttered around my back yard in the spring. And I never succeeded. But this lady brought in some glass frames with pinned down dead butterflies. She pointed out colors and talked about species, but all I could think about was the fact that they were dead. She said that they had saved the butterflies so that we could learn about and understand them more. She said that they wouldn’t have lived long anyway. But they were still killed and pinned down. Their flurry of movement was reduced to a single static moment, forever. I could catch them now, but that was no fun. And that’s how I feel when I write about dance performances. A one-time experience is pinned down so that it lasts, but isn’t really the same. Intangible moments are reduced to a crude linguistic approximation. I write down one interpretation and kill the rest. I still like writing about dance. There are advantages to killing butterflies. You can look at their colors up close and point out their patterns. You can discover and classify the range of types. You can introduce them to people who don’t have butterflies in their yard or those who never thought to go outside and look. But lets not forget the violence that’s involved.